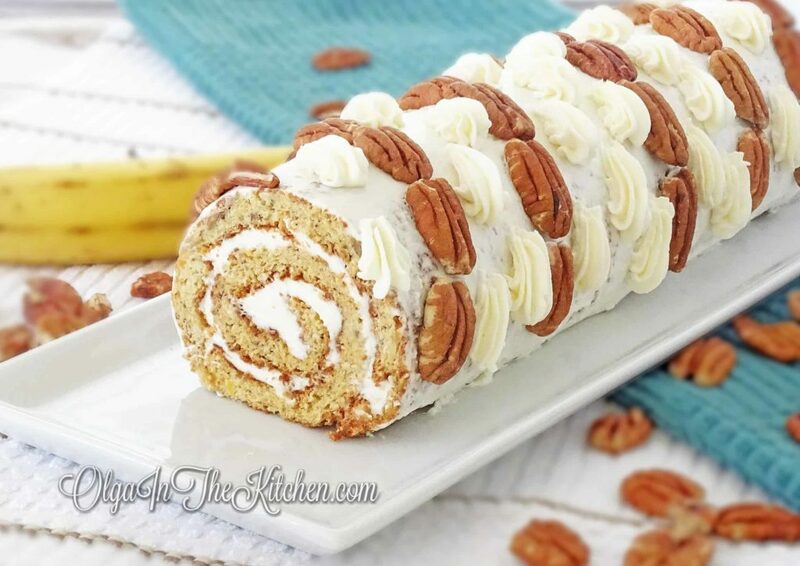 This Banana Cake Roll is sweet, fruity, tangy and incredibly delicious at the same time. 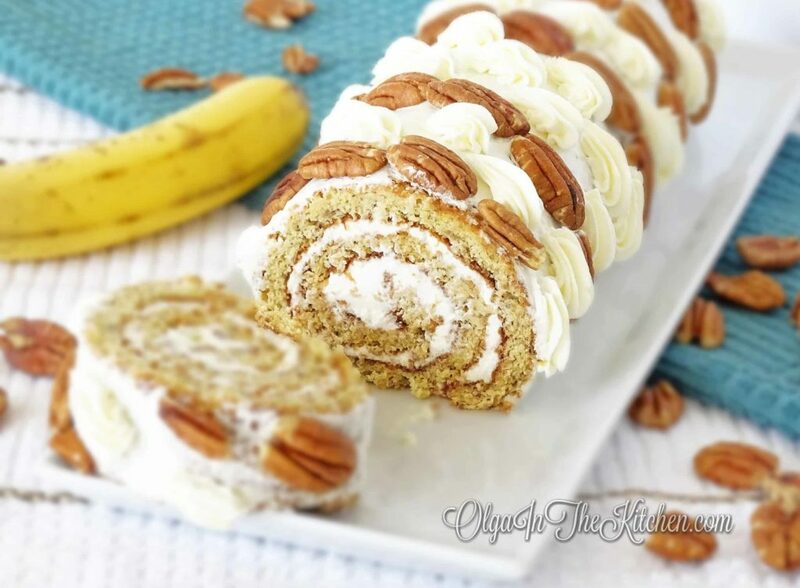 The lemony filling, pecans and banana are all such a great combination of goodness. 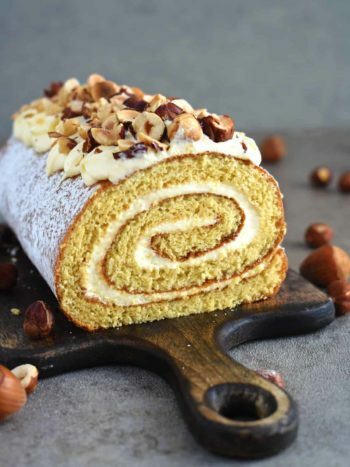 In the past I would usually bake honey cake roll or just plain white and add some fruity filling to end up with something different. 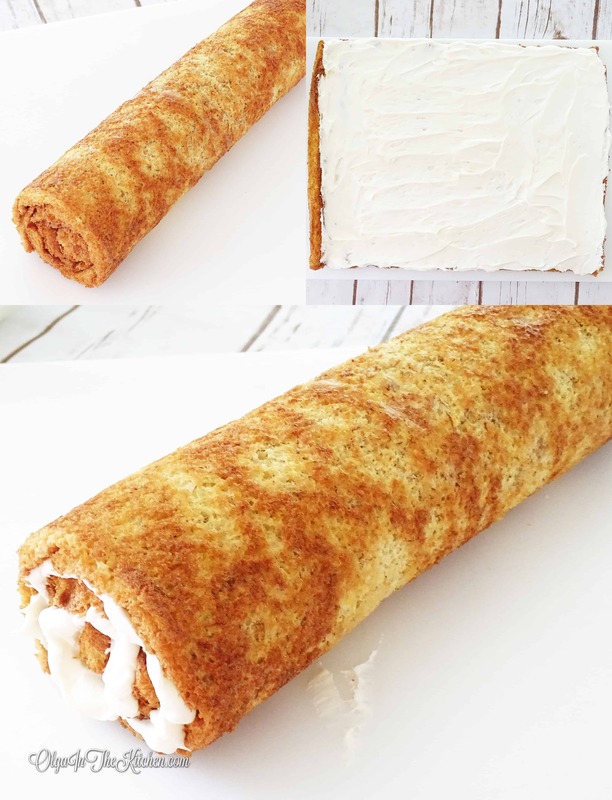 Like any other cake roll, this recipe is very easy to make, it’s quick and it’s one of those recipes that you can make in the morning and serve later in the day. 1. Preheat oven to 375° F. Line a parchment paper with baking sheet. 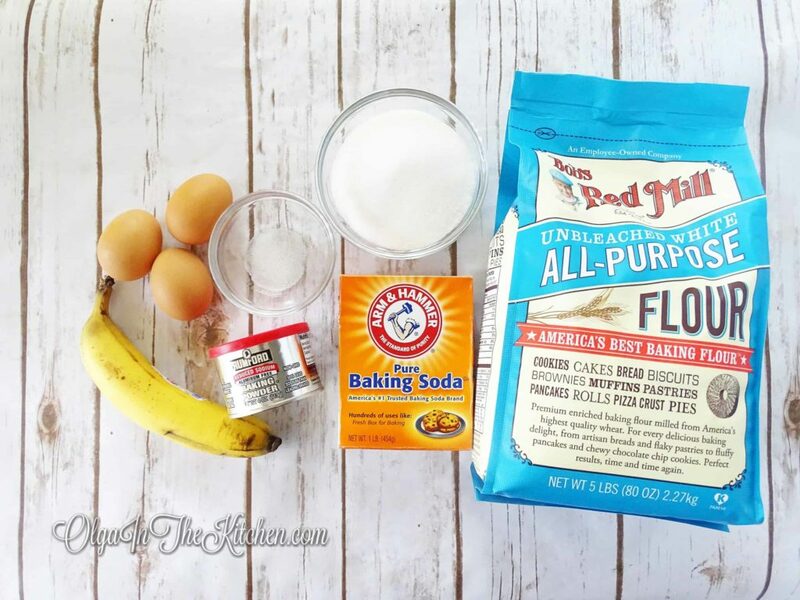 In a medium bowl, whisk together 3/4 cup all-purpose flour, 1/2 tsp baking soda and 1/2 tsp baking powder. 2. In a large bowl, combine 3 eggs, 3/4 cup sugar and 1/4 tsp salt. Beat on high until thickened and light in color (5-6 mins). 3. Cut 1 ripe banana into 1” pieces and mash it with fork. 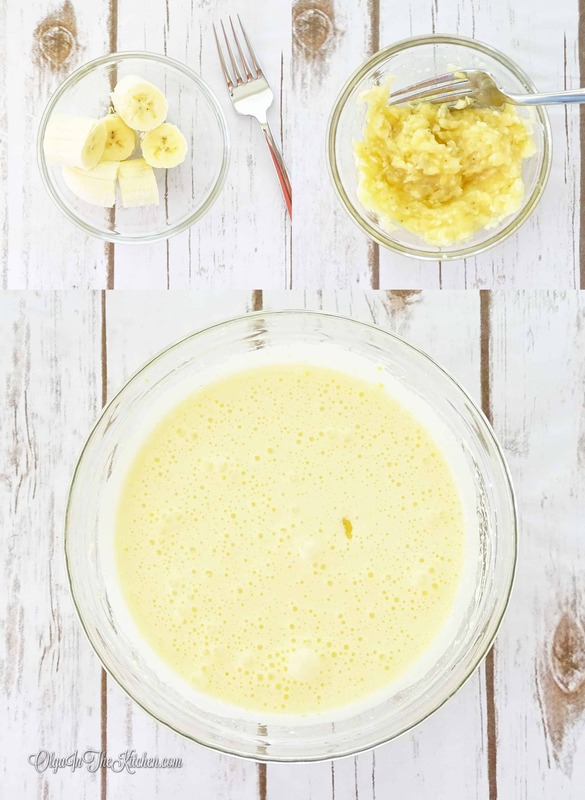 Add banana into egg mixture and beat on low for 30 seconds. 4. Sift dry ingredients into the batter. With help of spatula, gently stir in the dry ingredients; try not to over mix. Spread batter evenly into prepared baking sheet. Use spatula to evenly spread the batter throughout the baking sheet including corners and edges. Bake 13-15 mins until dark golden. (I did 13 mins). 5. Immediately loosen cake roll from edges of baking sheet. Gently pressing with your hands, roll it before it gets cold and dries up (will start breaking). You can use 2 pieces of paper towel to help you roll the cake roll as it will be really hot, you won’t be able to do with your bare hands. Set aside to cool while you make the filling. 6. In a medium bowl, beat 4 oz cream cheese on low-medium for 1 minute. Add 1 tbsp freshly squeezed lemon juice and 1/2 cup sifted powdered sugar and beat again for 1 minute. While still beating, add 1 1/4 cups heavy whipping cream, switch to high and beat for about 3 mins or until thick and fluffy. Refrigerate filling until you’re ready to use it. 7. Slowly unroll banana cake roll to prevent from breaking. Evenly spread the filling throughout the cake roll leaving 2-3 tbsps filling for decoration (make sure to get the edges to avoid dry edges). Slowly and gently roll back. 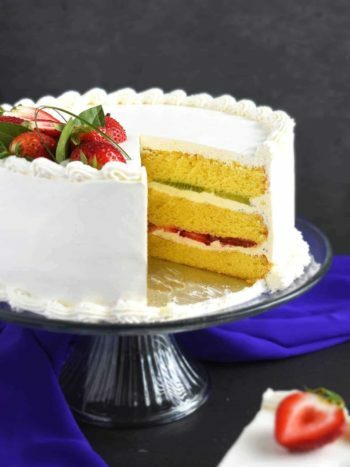 (I usually cut off the edges of the cake roll before decorating with final touch so that it looks even more beautiful). 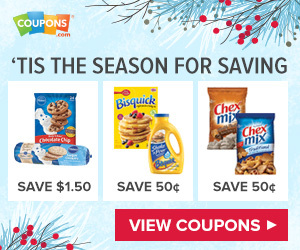 Decorate with pecans or anything of your choice. Enjoy!!! 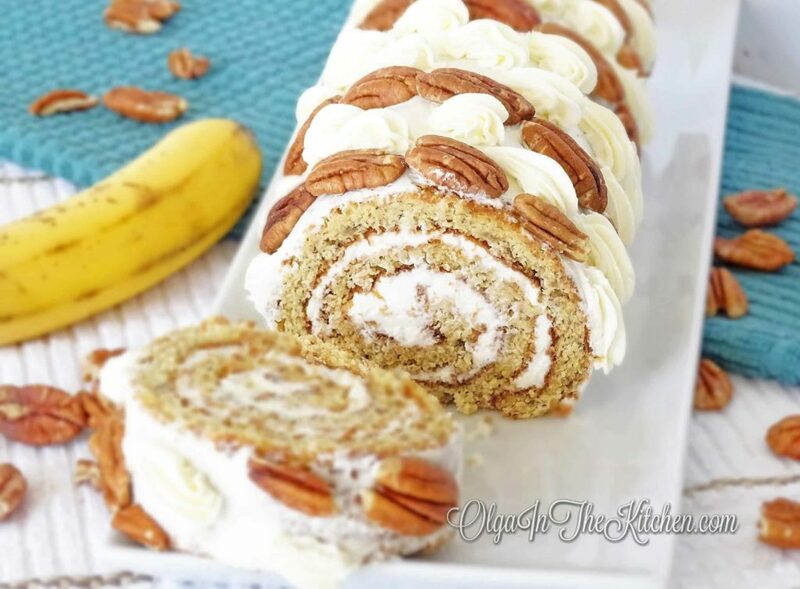 Banana Cake Roll: sweet, fruity, tangy and delicious. 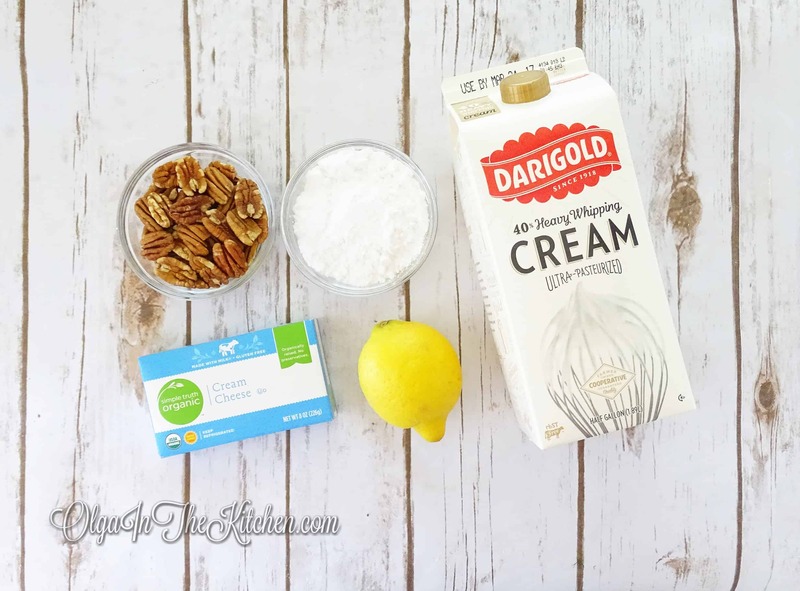 Great combo of lemony filling, pecan decor and banana dough. Preheat oven to 375° F. Line a parchment paper with baking sheet. 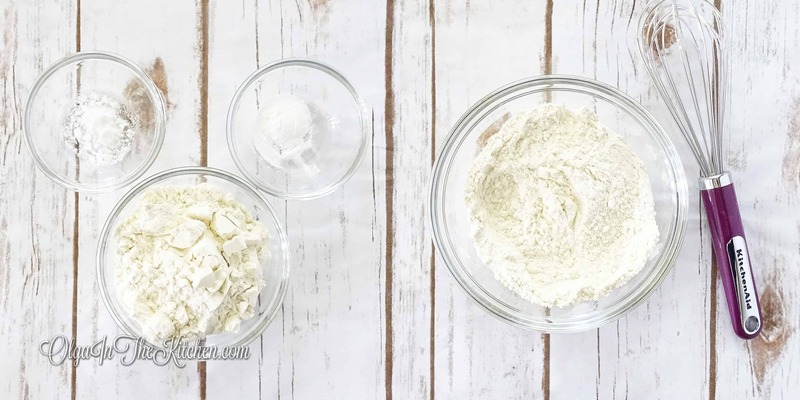 In a medium bowl, whisk together 3/4 cup all-purpose flour, 1/2 tsp baking soda and 1/2 tsp baking powder. In a large bowl, combine 3 eggs, 3/4 cup sugar and 1/4 tsp salt. Beat on high until thickened and light in color (5-6 mins). Cut 1 ripe banana into 1” pieces and mash it with fork. 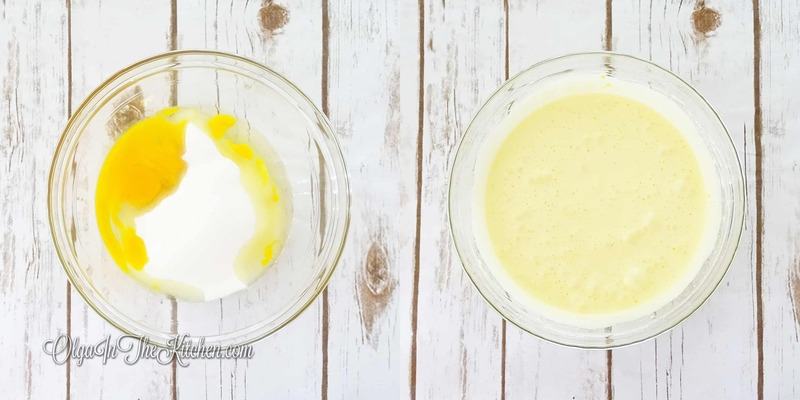 Add banana into egg mixture and beat on low for 30 seconds. Sift dry ingredients into the batter. With help of spatula, gently stir in the dry ingredients; try not to over mix. Spread batter evenly into prepared baking sheet. 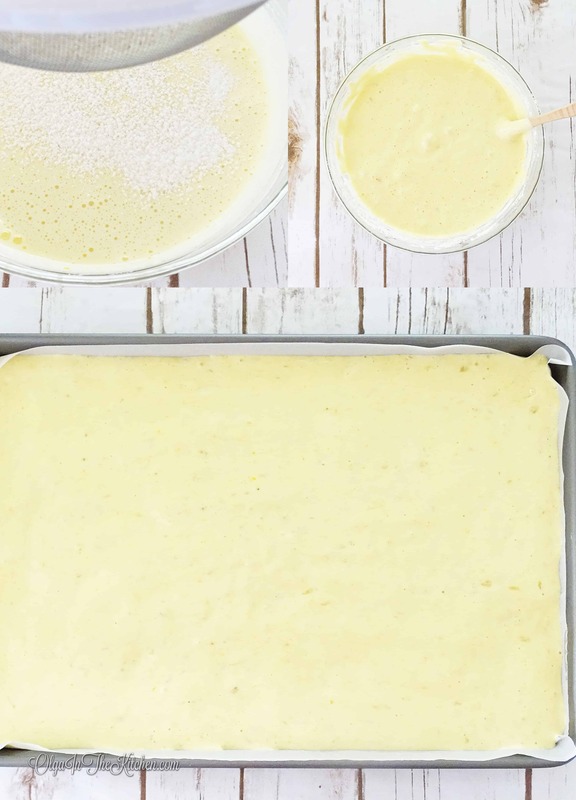 Use spatula to evenly spread the batter throughout the baking sheet including corners and edges. Bake 13-15 mins until dark golden. (I did 13 mins). Immediately loosen cake roll from edges of baking sheet. Gently pressing with your hands, roll it before it gets cold and dries up (will start breaking). You can use 2 pieces of paper towel to help you roll the cake roll as it will be really hot, you won’t be able to do with your bare hands. Set aside to cool while you make the filling. 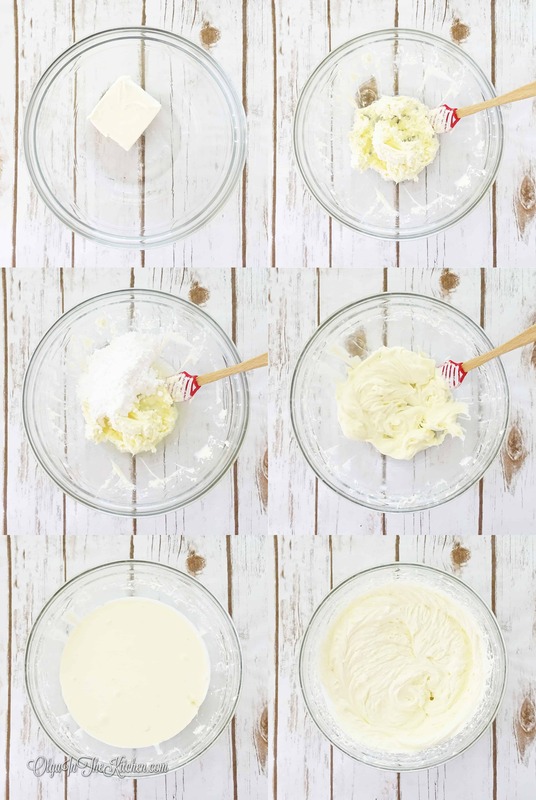 TO MAKE CAKE ROLL FILLING: In a medium bowl, beat 4 oz cream cheese on low-medium for 1 minute. Add 1 tbsp freshly squeezed lemon juice and 1/2 cup sifted powdered sugar and beat again for 1 minute. While still beating, add 1 1/4 cups heavy whipping cream, switch to high and beat for about 3 mins or until thick and fluffy. Refrigerate filling until you’re ready to use it. Slowly unroll banana cake roll to prevent from breaking. Evenly spread the filling throughout the cake roll leaving 2-3 tbsps filling for decoration (make sure to get the edges to avoid dry edges). Slowly and gently roll back. 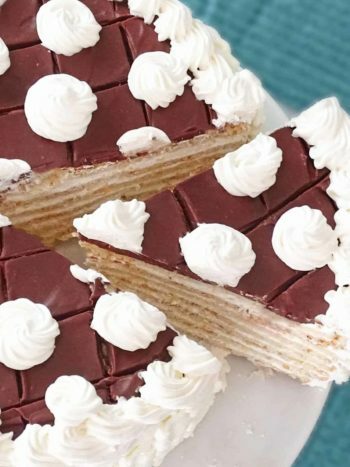 (I usually cut off the edges of the cake roll before decorating with final touch so that it looks even more beautiful). Decorate with pecans or anything of your choice. Enjoy!!! Excuse my drool, but this looks AH. MAZ. ING. I am obsessing over this– so fun! 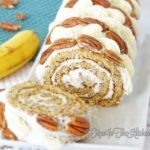 This is literally the best banana dessert I’ve ever tried! 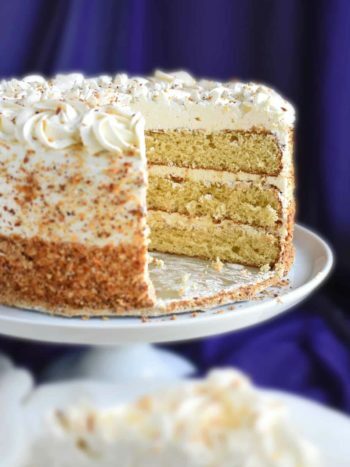 It’s fluffy, sweet and just simple delicious!